COLORADO SPRINGS GRILL STORE USES ONLY QUALITY PELLETS IN OUR SMOKERS! Excellent 100% all natural wood pellets for pellet smokers. Smoke Ring makes a competition blend of Maple-Hickory-Cherry, a Oak-Hickory-Cherry, and a Maple-Beech-Cherry pellets in 20lb bags. The pellets themselves are a little smaller diameter compared to most other brands but has excellent flavor and smoke production at low temperatures. For cranking up the heat, Smoke Ring pellets have no problem fueling you grill to its max heat level. One of the only pellet brands we use in our smokers and smoking tubes, BBQr's Delight has natural flavored woods that are blended with oak to bring its users a clean burning fire for their cookers. The flavored wood is blended with oak sawdust and pelletized. We carry both 1 and 20 lb bags in store in a variety of flavors. Napoleon uses natural wood flavoring in their chips. 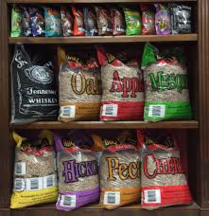 Flavors range from Whiskey barrel oak to apple or cherry chips. Their whiskey oak flavor is made by recycling used oak whiskey barrels. We have mesquite, cherry, apple, maple, whiskey oak and hickory flavors in store. Seasoned for a minimum of 2 months, the natural flavored woods are cut into 3 to 6 inch chunks. All woods are kiln dried by the Good-One and ready for use in your smoker! 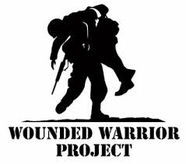 We carry cherry, hickory, pecan, mesquite, apple and maple flavored woods in store. 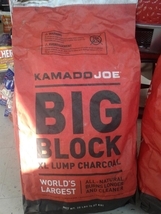 Premium natural hardwood lump charcoal in 20 lb bags. This charcoal comes in larger pieces making it easier to stack and handle. Blues hog charcoal is made using Missouri hardwoods and burns clean. Stop by and pick up some to try for yourself! Test it against your current charcoal. Kamado's specifically produced charcoal for their units. Is a blend of three hardwoods slow roasted to produce each bag of coal. Burning longer, better and cleaner than a lot of competing brands. This bag contains some of the bigger chunks of lump coal we have seen! Get some to test today!